Figure 1. 2017 monitoring sites (Red: Near-shore; Blue: Off-shore). 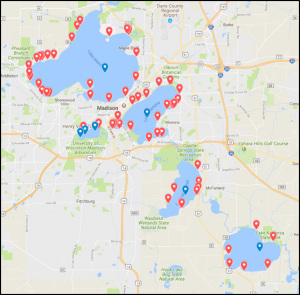 From Memorial Day to Labor Day, volunteers at piers and beaches around the five Yahara lakes measured near-shore water clarity, air and water temperature, and noted several visual observations. Visual observations included presence of algal blooms (green/blue-green), floating plant debris, swimmers, waterfowl, wave intensity, and general water appearance. 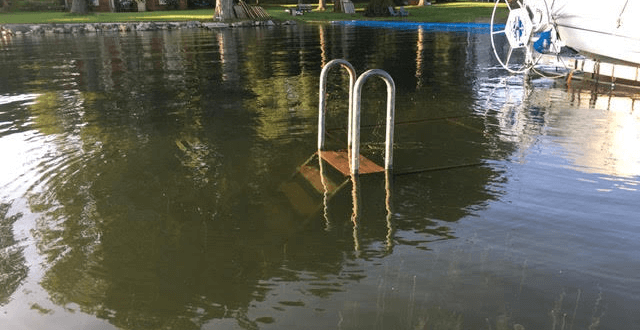 Volunteers were asked to log condition reports at least weekly on our website, lakeforecast.org, where all data are updated in real time.